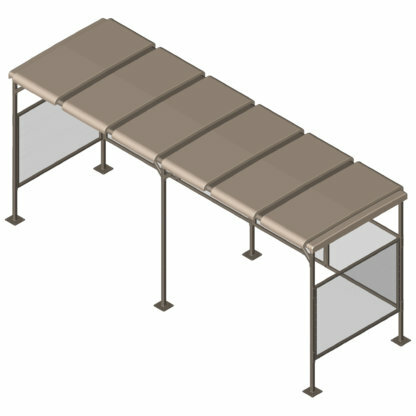 The CyclePort Shelter™ is a modular bicycle shelter system that has a design to blend with traditional or modern environments to provide organized, covered storage of bikes. 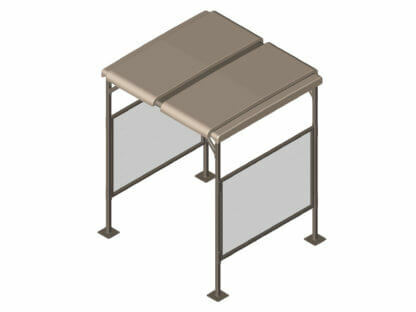 Basic unit features a sandstone polyurethane finish on a compression-molded top contoured for runoff. Support frames consist of heavy gauge steel tubing protected with polyester powder coat taupe finish or custom colors upon request. Side panels can be specified with plexiglass, wire mesh, or perforated metal for additional protection from the elements with options for signage or graphic panels. Modular possibilities with CycleSafe shelters are infinite. A CyclePort Bike Shelter covers 2 bikes per top panel and can be outfitted with U bike racks or any combination of our vertical bike rack systems. Double the storage possibilities to 4 bikes per panel with our Hi-Density Bike Rack. Please choose the options below to begin the configuration of your bike shelter. CycleSafe customer service will contact you to finalize your choices, help customize your bike shelter or find the best partnering CycleSafe system product. How Many Shelters in a Bank? 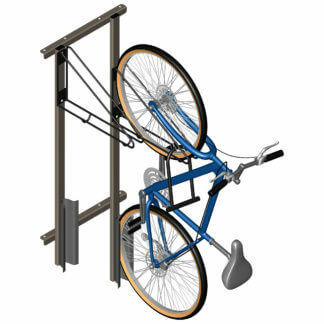 Designed to cover your bicycle parking needs: specify Staple Racks, Wall Rack Frames, or Hi-Density Racks depending on site capacity requirements, footprint and budget. Site flexibility: CyclePort Shelters feature 2 or 3 top units that can be configured in multiple ways to accommodate site constraints. Modular for expansion: combine with CycleSafe double-tier bike lockers to meet long-term commuter needs and short-term parking needs. Added security: side and back panels can be specified with plexiglass, wire mesh, or solid panels with options for graphic display.